array of LEDs will stay illuminated even if a single LED in a string fails. The PLED6M Series is designed for use with one-watt LEDs, nominally 350mA @ 3V, and the low turn-on voltage of 7.5V (max) allows for fast switching after an LED opens. 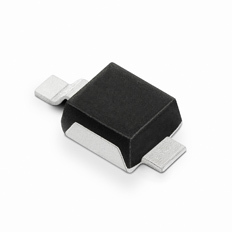 Furthermore, the on-state (bypass) voltage of 1.2V (max) reduces the steady state power dissipation following an LED open failure and is housed in a small form factor Powermite® package.